Arthur Cove created the orange nymph, reputedly for when snails are on the surface. On warm summer days on some still waters you often get colourful daphnia, this nymph can well compete with them. He recommended it to be used on bright sunny days. The theory being that when trout look up at floating snails, which may seem semi-translucient, they would have a faint orange hue from the direct summer sunshine. Hook : Size 8 to 12. Thorax : Build up of orange seal's fur. 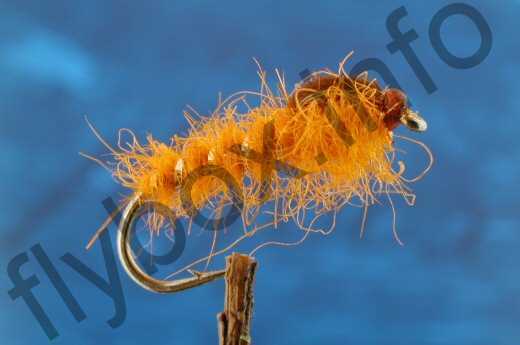 Currently there are no comments about the Cove's Orange Nymph fly pattern from other fly fishermen yet.